If you’re hand-walking your horse, the relevant provision of the Motor Vehicle Act is section 182, which provides direction to pedestrians. The walking of the horse is incidental. “Pedestrian walking along highway – 182 (1) If there is a sidewalk that is reasonably passable on either or both sides of a highway, a pedestrian must not walk on a roadway. Horses are large powerful animals that often weigh over 1000 pounds so a collision with one poses considerable risk to the motor vehicle and its occupants, as well as to the horse and rider. Note that when riding on the shoulder of a roadway, a rider is signalling to motorists that they are yielding the road (i.e. when a motorist pulls their vehicle over to the right, it means that the other traffic may pass). However if a rider is having difficulty or is unsure of their horse, as with an inexperienced horse, legally they may remain in the roadway indicating their possession of the right-of-way in the right-hand lane, thus encouraging vehicles to pass in the left hand traffic lane when safe to do so. If riding on the shoulder, stay as far off the roadway as possible. The law that stated such has long since been repealed. In B.C., anyone who uses a public road is considered a “road user”, so the days of ultimate right-of-way are gone! …but every road user has a specific set of responsibilities to ensure their own safety and that of other road users. Being able to properly control their horse is the principal responsibility of every rider. RESPONSIBILITY LIES WITH BOTH RIDER & MOTORIST! 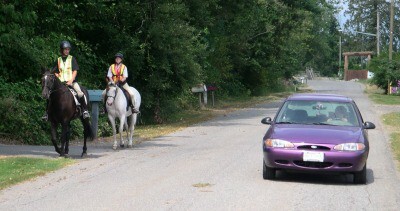 Riders have every bit as much responsibility to control their horses as drivers are required to control their vehicles. Good manners and manageability under saddle are imperative for any horse, but those lessons become critical whenever we expose our equine friends to greater risks such as those likely to be encountered on the road. If you cause an accident you can be liable, so take all the right precautions. 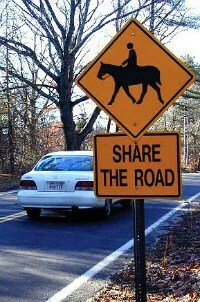 Respect the laws, obey signage, ensure that you and your horse are highly visible, and be sure that your horse has sufficient training to ensure readiness for the different sights and sounds of riding on the roads. Get insurance. 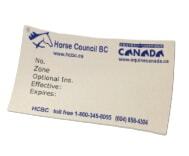 Horse Council BC offers third-party liability insurance as part of their membership; this covers members in cases where a lawsuit is brought against an individual for damages that may be caused by a horse that they are in ownership or use of. Don’t leave yourself unprotected!